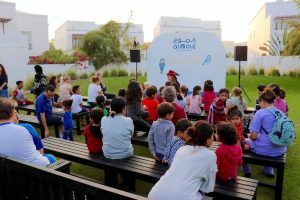 As a first of its kind initiative to be introduced in Oman, Al Mouj Muscat is proud to be part of the worldwide Little Free Library programme that aims to inspire the love of reading for people of all ages and backgrounds and to connect people in their neighbourhoods. Through this non-profit worldwide movement, across the world millions of books are exchanged each year, profoundly increasing access to books for readers of all ages and backgrounds. 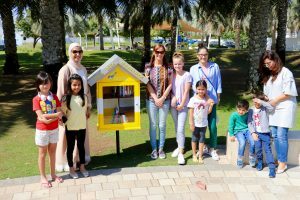 Currently, there are four Little Free Library kiosks located at Al Mouj Muscat development – in The Walk, Marsa Promenade, Reehan Residences and Beach Park. Symbolised a birdhouse and peace pole design that are lit up at night by solar lights, the book boxes are available for anyone from the community to take a book or bring a book to share. This “take a book, return a book” free book exchange offers a way to share good things to read — favourite books from your childhood or books you would recommend to friends; books that teach and engage you. In today’s digital world, smart devices and technology is influencing our social engagement and result in less interaction and real connection between people. Why not use this resource as an inspiration to set up a book club with your neighbours or take a few moments out of your otherwise busy day to sit down in a coffee shop with a friend to enjoy a chapter or two from a new book. 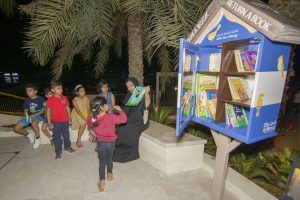 Community members have already shown a hugely encouraging response to the book sharing initiative and a multitude of books from different genres, in numerous languages and for children and adults, can already be found in the Little Free Library kiosks across the development. These libraries are a gift from Al Mouj Muscat and belong to everybody – neighbours, friends, and public, which is why we want to take care of it. You can help our volunteer stewards maintain the Little Free Libraries and keep them fully stocked with good reading material by donating books that you no longer read for someone else to enjoy. As Oman’s leading lifestyle destination, Al Mouj Muscat continues to work towards enhancing the wellbeing of the community, by encouraging community initiatives that enrich knowledge and forge connections with those that live and visit the destination. Modern-day living at Al Mouj Muscat goes beyond simply living in a house or visiting a mall; it adds value to people’s lives by providing ways to bring communities closer together. 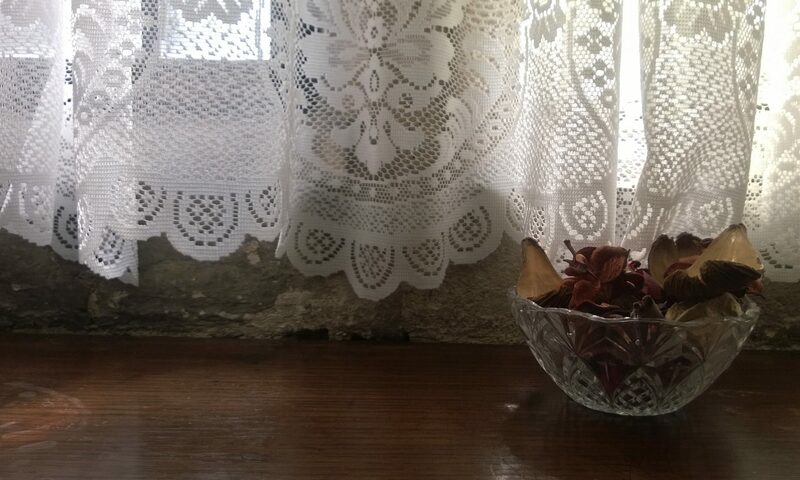 Previous PostPrevious Hello Study in Oman Readers !